BlackBerry is close to once again becoming a private company after signing a letter of intent agreeing to be bought. The suitor in the situation is a group led by a financial holdings company. The deal between BlackBerry and group spearheaded by Toronto-based Fairfax Financial Holdings Limited is worth approximately $4.7 billion (about £2.93b, AU$4.98b) at $9 per share (about £6, AU$10) in cash for all of the shares that Fairfax doesn't already own. "We believe this transaction will open an exciting new private chapter for BlackBerry, its customers, carriers and employees," said Fairfax Chairman and CEO Prem Watsa in a press release today. He said it would continue "a long-term strategy in a private company with a focus on delivering superior and secure enterprise solutions to BlackBerry customers around the world." Fairfax currently owns about 10% of BlackBerry's common shares. According to the same press release, the company's board of directors approved the letter of intent on the recommendation of the special committee BlackBerry created last month to explore "strategic alternatives" to its current, failing situation. A due diligence period is in place, though the parties hope to have everything wrapped up by Nov. 4. Until then, BlackBerry can "actively solicit, receive, evaluate and potentially enter negotiations with parties that offer alternative proposals." "The special committee is seeking the best available outcome for the company's constituents, including for shareholders," said Barbara Stymiest, chair of BlackBerry's board of directors, in the release. "Importantly, the go-shop process provides an opportunity to determine if there are alternatives superior to the present proposal from the Fairfax consortium." The press release noted that the transaction is far from a done deal as due diligence may prove unsatisfactory, financing must still be secured, regulators have to give the go-ahead and a definitive agreement must be finalized. Still, the wheels are definitely in motion for BlackBerry's ownership to change hands. The phone maker has had a volatile few months after the launch of BlackBerry 10, including a Sept. 20 announcement in which it admitted it needed to pull back from the consumer market and focus on enterprise. In the same announcement, it revealed it expects a net operating loss of about $950 million to $995 million for the second quarter of this year. That's roughly £592m/AU$1.01b to £621m/AU$1.05b. Adding insult to injury, BlackBerry said it would lay off 4,500 employees, or about 40% of its workforce. The company also had to hit pause on an anticipated app roll out, BBM app for iOS and Android devices. 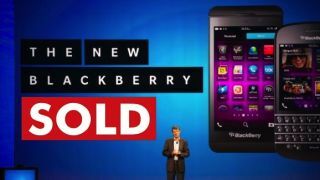 All of these deep cuts could stem BlackBerry's losses, but its lack of a particularly appealing product on the consumer or enterprise level has left people wondering: how did BlackBerry last this long? Come Nov. 4, it may have finally found its way out. Read the 11 moments that defined BlackBerry's rise and fall.